Former air marshal Husni Mubarak, now 86, had ruled Egypt for 30 years when his military colleagues forced him from office in 2011. Three years and many upheavals later, those same colleagues replaced his successor with retired field marshal Abdel Fattah al-Sisi, 59. The country, in short, made a grand round-trip, going from military ruler to military ruler, simply dropping down a generation. 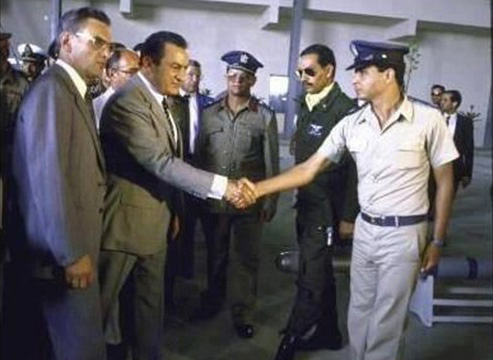 Husni Mubarak (left) shaking hands with Abdul Fattah Al-Sisi in an undated picture that Sisi's admirers see as the symbolic passing of a generational torch. This return raises basic questions: After all the hubbub, how much has actually changed? Does Sisi differ from Mubarak, for example, in such crucial matters as attitudes toward democracy and Islam, or is he but a younger clone? Sisi remains something of a mystery. He plays his cards close to the vest; one observer who watched his presidential inaugural speech on television on June 8 described it as "loaded with platitudes and very long." He left few traces as he zoomed through the ranks in three years, going from director of Military Intelligence and Reconnaissance to become the youngest member of the ruling military council, and then rapidly ascending to chief of staff, defense minister, and president. 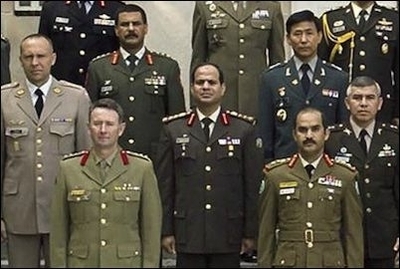 Fortunately, a document exists that reveals Sisi's views from well before his presidency: An essay dated March 2006, when he attended the U.S. Army War College in Carlisle Barracks, Pennsylvania. His 5,000-word English-language term paper, "Democracy in the Middle East," has minimal intrinsic value but holds enormous interest by providing the candid views of an obscure brigadier general soon and unexpectedly to be elected pharaoh of Egypt. Brig. Gen. Abdel Fattah al-Sisi (center) in a 2006 group picture of the International Fellows class at the U.S. Army War College in Carlisle, Pennsylvania. While one cannot discount careerism in a term paper, Sisi's generally assertive and opinionated tone – as well as his negative comments about the United States and the Mubarak regime – suggest that he expressed himself freely. In the paper, Sisi makes two main arguments: democracy is good for the Middle East; and for it to succeed there many conditions must first be achieved. Sisi discusses other topics as well, which offer valuable insights into his thinking. Sisi endorses democracy for practical, rather than philosophical, reasons: it just works better than a dictatorship. "Many in the Middle East feel that current and previous autocratic governments have not produced the expected progress." (I have slightly edited his English for the sake of clarity.) Democracy has other benefits, as well: it reduces unhappiness with government and narrows the vast gap between ruler and ruled, both of which he sees contributing to the region's backwardness. In all, democracy can accomplish much for the region and those who promote it "do have an opportunity now in the Middle East." In parallel, Sisi accepts the free market because it works better than socialism: "many Middle East countries attempted to sustain government-controlled markets instead of free markets and as a result no incentive developed to drive the economy." It is reasonable, even predictable that General Sisi would view democracy and free markets in terms of their efficacy. But, without a genuine commitment to these systems, will President Sisi carry through with them, even at the expense of his own power and the profits from the socialized military industries run by his former colleagues? His 2006 paper implies only a superficial devotion to democracy; and some of his actions since assuming power (such as returning to appointed rather than elected university deans and chairmen) do not augur well for democracy. (1) It must adapt to Islam. He describes "the religious nature" of the Middle East as "one of the most important factors" affecting the region's politics. Islam makes democracy there so different from its Western prototype that it "may bear little resemblance" to the original. Therefore, it "is not necessarily going to evolve upon a Western template" but "will have its own shape or form coupled with stronger religious ties." Those religious ties mean that Middle Eastern democracy cannot be secular; separating mosque and state is "unlikely to be favorably received by the vast majority of Middle Easterners," who are devout Muslims. Rather, democracy must be established "upon Islamic beliefs" and "sustain the religious base." The executive, legislative, and judicial branches all must "take Islamic beliefs into consideration when carrying out their duties." Presumably, this translates into the Islamic authorities under President Sisi reviewing proposed laws to safeguard Islamic values, regardless of what the majority of voters wants. (2) The West should help, but not interfere. The West looms large for Sisi, who fears its negative influence even as he seeks its support. He has many worries: The great powers want a democracy resembling Western institutions rather than accepting a democracy "founded on Islamic beliefs." He interprets the then-named global war on terror as "really just a mask for establishing Western democracy in the Middle East." To meet their energy needs, Westerners "attempt to influence and dominate the region." The wars they started in Iraq and Afghanistan need to be resolved before democracy can take root. Support for Israel raises suspicions about their motives. Sisi's major concern is U.S. rejection of democracies that "may not be sympathetic to Western interests." He demands that the West not interfere when its adversaries win elections: "The world cannot demand democracy in the Middle East, yet denounce what it looks like because a less than pro-Western party legitimately assumes office." Translation: Do not call President Sisi anti-democratic when he pursues policies Washington dislikes. But the peoples of the Middle East also need the West. In the economic arena, they are unlikely to succeed "without external support from Western democracies." Accordingly, he pleads for the U.S. government to assist "supportive economic nations in the Middle East, such as Egypt." President Sisi wants American taxpayers to continue footing his bills. The West is also the answer, in Sisi's view, to the sycophantic and unaccountable Middle East media. "If corruption exists in the government, it is likely to go unreported." Therefore, he wants those in power "to let go of controlling the media." To build a superior press, Sisi looks to the West, specifically to international news organizations and to governments. Inasmuch as President Sisi quickly intimidated the Egyptian media into obsequiousness as soon as he assumed office, it is good to know that, in principle, he appreciates a free press. Westerners who meet with him should unceasingly remind him of this. (3) Giving the people more responsibility. Democracy does not emerge on its own, Sisi asserts, but "needs a good environment – like a reasonable economic situation, educated people, and a moderate understanding of religious issues." The problem in Egypt is that, "the nature of the population has been one of dependence upon and favor from the government." How to break this dependence? "Education and the media are the key enablers toward the establishment of democracy; there must be a shift from state controlled means to population controlled means." General Sisi understood that Egypt needs a politically mature citizenry; but will President Sisi permit it to emerge? Examining his three preconditions, the first two give Sisi, as ruler, the freedom to act anti-democratically. Only the third component would, in fact, help bring about democracy. One unexpected theme that emerges from his paper concerns Sisi's (possibly neo-Nasserist) hope that the Middle East become a single unit: "the Middle East should organize as a region." He wants the Middle East (an area he does not define; one wonders whether Israel would be included) to view itself "much in the same manner as the European Union," implying a customs union, a single currency, freedom of cross-border movement, and a joint foreign policy. He offers this as a goal of free elections: "Democracy in the Middle East … must find a unifying theme that draws the Middle East into a unified region." Clearly, Sisi faces too many pressing domestic issues to try to unify the deeply divided and increasingly anarchic Middle East; should he long remain in power, however, this could become one of his goals and perhaps even take the form of an anti-Muslim Brotherhood alliance under his leadership. Which brings one to the deepest mystery about Sisi: is he an Islamist, someone seeking to apply the Islamic law in all its severity and in its entirety? Personally pious, he is said to have memorized the Koran. According to the Financial Times, "Not only does his wife don the Islamic headscarf now sported by most Egyptian women, but one of his daughters is also said to wear the niqab" (a body and head cover that reveals only the eyes). He became defense minister because the Muslim Brotherhood considered him an ally. Since then, however, he has made himself the mortal enemy of the Muslim Brotherhood while allying with the yet more extreme Salafis, Islamists trying to live as Muhammad did. While Sisi's 2006 essay does not resolve these contradictions, it does offer clues. Several of his observations about early Islam make it clear that Sisi aligns himself with the Salafis. With them, he recalls the period of Muhammad and the Four Righteous Caliphs (612-660 A.D.) as not only "very special" and "the ideal form of government," but also "the goal for any new form of government." With these early caliphs as models, he envisions Muslims uniting "so that the earliest form of El Kalafa [the caliphate] is reestablished." In passing, he gratuitously denigrates the Shi'is of early Islam (for attempting to offer power "to family members [of Muhammad] rather than to the most qualified leaders"). Other comments of Sisi's, however, criticize Islamists. When an actual caliphate recently declared itself in Syria and Iraq, he responded a week later with unrestrained hostility. Shortly before he submitted his paper in 2006, Hamas, a Muslim Brotherhood offshoot, won a victory in the Palestinian legislative elections, prompting Sisi's mild but critical observation that elected Islamists are likely to face "internal governance challenges down the road." He added that "there is hope that the more moderate religious segments can mitigate extremist measures," although Sisi's current hard line against the Muslim Brotherhood in Egypt suggests that he (along with millions of other Egyptians) has given up any such hope. Sisi even states that Islam as such creates political problems for rulers: "The religious nature of the Middle East creates challenges for the governing authorities." Faux democracy: "Many autocratic leaders claim to be in favor of democratic ideals and forms of government, but they are leery of relinquishing control to the voting public of their regimes." Also: Middle Eastern governments that claim to be democratic actually "have very tight centralized control and unfairly influence election outcomes through control of the media and outright intimidation." Poor economic policies: "Excessive government controls and bloated public payrolls stifle individual initiative and tend to solidify the powerbase of ruling political parties. In Egypt under President Sadat, government controls were lifted in an effort to stimulate economic growth; however, these efforts have not blossomed under President Mubarak." Lackey intelligence services: "The security forces of a nation need to develop a culture that demonstrates commitment to a nation rather than a ruling party." The pre-political brigadier-general of 2006 anticipated the somewhat contradictory chief of staff, defense minister, and president. Sisi is a pious Muslim ambivalent about Islamists, a fan of the caliphate in theory who rejects it in practice, a critic of Mubarak's who permitted the revival of his political party, a fan of democracy who "wins" 97 percent of the vote, a military officer theorizing on forms of democracy, a fan of independent media who allows journalists to be convicted of terrorism charges, a critic of tyranny who encourages adulation of himself. Sisi, clearly, remains a work in progress, a 59-year-old still trying to discover who he is and what he thinks even as he rules a country of 86 million. On-the-job training is literal in his case. Amid the political brush fires and exigencies of present-day Egypt, the gist of his eight-year old ideas are likely to emerge as dominant: a heavily conditional form of democracy, at once safe for Islam and from Islam, experiments to loosen controls over the intelligence services, the economy, education and the media, varying tactics toward Islamists, as well as a revived attempt to make the region of the Middle East a world power. 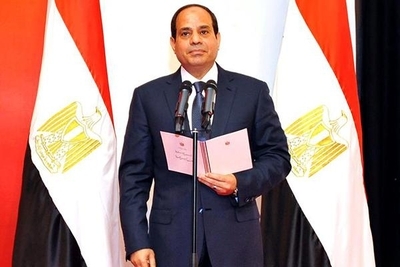 The newly-inaugurated President Abdel Fattah Al-Sisi on June 8, 2014. But will he have the time and opportunity to achieve these many goals? Unless he shows a hitherto-unseen competence, his chances are slim. Outside powers can help by cooperating with Sisi on immediate concerns (arms, counterterrorism, and intelligence) and pressuring him on longer-term issues (military business operations, the rule of law, and human rights). Is Sisi Islam's Long-Awaited Reformer?